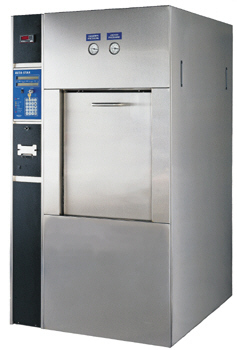 The Model 500 Series sterilizers are designed for use in any industrial, laboratory, research or surgical setting. The sterilizer chamber and vertical sliding door are constructed of non-corrosive stainless steel. The complete unit is enclosed in easily removable stainless steel panels. The Y2K compliant microprocessor control utilizes various processes to sterilize agars, medias, instruments, glassware, food, bedding, fermenters, liquids, shoeboxes, biohazardous wastes, etc. 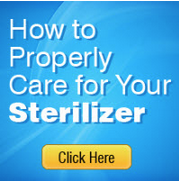 The sterilizer chamber, jacket and vertical sliding door are constructed of non-corrosive stainless steel. The inner shell and door are designed for working pressures of minimum 50 PSIG / Full Vacuum. The pressure vessel complies with applicable requirements of the ASME codes section VIII division for unfired pressure vessels and shall be stamped accordingly. A signed copy of ASME form U-1 is furnished. The doors are constructed of solid 1" thick type 316L stainless steel. Doors are manually or power operated (option) as specified. The solid non inflatable door gasket is pneumatically sealed by air pressure behind the gasket. Once cycle begins, a pneumatic locking device engages to prevent the door from lowering or when pressure is present in the chamber. Door interlocks prevent opening of two doors at the same time on double door units. The door cover, front and side fascia panels are stainless steel and polished to a No. 4 finish. The fascia panels are completely removable, without use of tools, to provide easy access to piping subassemblies. Chamber racks, extendable shelves, loading cars, and transfer carriages are of welded construction and fabricated from 316L stainless steel. All piping subassemblies will be comprised of non-proprietary standard industrial grade pneumatic valves and stainless steel, copper, bronze or brass components and piping as applicable. All units will use a stainless steel energy saving vacuum/heat exchanger/air/liquid seperator. All electrical wiring, devices and components are UL listed, and of standard non-proprietary industrial grade. Beta Star warrants that each sterilizer is carefully tested and inspected and leaves the factory in proper working condition, free of visible defects. Extended service and warranty programs are available, full details of warranty programs are available upon request.